Her handwriting is amazingly awesome and on top of that her comments are incredibly inspiring and so sweet. I have to admit that some of her notes to her kids have made me tear up (heh I'm mushy like that). In addition to having some amazing handwriting, Deena has been following along with my leaf tutorials and has been producing some amazing work! She has graciously taken the time to answer a few questions of mine and I'm happy to share them with you. She goes into how she started bullet journaling and why she decided to incorporate doodles into her planning spreads! 1/ First, you are amazing in the journaling/planning community. You are awesomely well known for your handwriting. What's your secret? You flatter me! There's a story behind my handwriting, actually. In 4th grade, I had a teacher who told me I wrote messy...like a boy. As a tomboy who was unsure of where she fit in at the time, a girl who didn't quite fit in with the other girls, this really bothered me. From that point on, I made it a point to write neatly and "more girly." 2/ Can you explain your IG handle a little more? I started to make and sell key fobs for Christmas. I've always been into crafts: stamping, scrapbooking, and card making. I decided that I should create an IG account for my crafts so that customers could their options. I needed something that reflected me...A friend suggested a play on "designs" using the "Dee" in my name. Hence, "CraftyDEEsigns." I started bullet journaling and decided to post my pics on that account. Now it is completely dedicated to bullet journaling. 3/ How did you get into journaling/planning? How long have you been at it? I used to be all about using apps and technology. I tried some ready made planners but decided that I needed something that fit my life a little better. Then I found sketchnotes after doodling in teaching workshops. From sketchnotes, I fell into the Bullet Journal® rabbit hole. I decided to try bullet journaling in a blank comp book first. I figured if I kept with it, I could invest in an LT 1917. I stuck with it and loved it. I also realized that I NEEDED a good Bullet Journal®. The week of June 13, 2016, my husband went on a weeklong business trip, and I threw myself into starting my very first Bullet Journal® in an LT 1917. Now I rely solely on my Bullet Journal® and carry it everywhere. I found that I take better notes in the Bullet Journal®. I'm way more productive, and I have a creative outlet. A creative outlet is important now that life is busier and I don't have as much time to dedicate to crafting. 4/ What makes you want to incorporate drawing as part of your planning/journaling? Doodles make me happy. Finding doodle tutorials opened my eyes and made me realize that with a little help and a lot of practice, I really could learn to draw. In my opinion, having quotes and little doodles on my spreads make them interesting. When I'm happy with the way the spreads look, I revisit them more often. That helps with my productivity. Very honestly, I also love the way doodling relaxes me and settles my brain. I feel like my life is so busy with our business and being a mother to two very active teens, so I really need quiet time to wind down and relax. 5/ Are your doodles inspired by Zentangle? If so, what do you like about Zentangling? Zentangles... Another rabbit hole I explored. As a scrapbooker, cardmaker, and crafter, I found that I gravitate toward a simple, less busy style. I stumbled upon zentangle on so many awesome bullet journalists' spreads. I joined a FB zentangling group, and started incorporating them on my spreads. There's something about the repetitive drawing of lines and shapes that relaxes and calms me. For a time, I was zentangling every night to wind down. 6/ What do you like best about following a drawing tutorial? Do the templates help? Drawing tutorials are the only way to go for me. I don't have that "artistic eye" that artists like you have. I can't see where shadows go or visualize how something is supposed to look. That's why when amazing artists like you create step-by-step tutorials for noobs like me, I pounce on them. They take all the thinking out and I can relax my mind. And then, my spreads look legit! Hahahaha. 7/ Your handwriting is drool worthy! Do you think your good handwriting helps you with doodling? Again with the flattery. I do think my handwriting helps with doodling. I enjoy trying to write in different "fonts," which I think helps with the "imitation" part of doodling. Honestly though, while I know that people admire my handwriting, I truly believe that handwriting is soooooo very personal, and each person's writing is a part of their personality. My mom passed away a little more than ten years ago, and when I see her handwriting, which was so distinctive, I feel warm inside. Her recipes, her notes, all remind me of her. 8/ What advice can you give to a doodling newbie? Practice, don't judge yourself harshly, and have fun. Most importantly, follow IG doodling accounts. Your tutorials are simple, and easy-to-follow, and honestly, I look forward trying them out every single time. So as you can see, Deena has some amazing advice for both newbie and seasoned journalers and doodlers. I want to give her a big shoutout for following my tutorials and all photos credits go to her! If you want to show her some love, follow her on Instagram @craftydeesigns! She's incredibly sweet. If you have any IG accounts that you think are spectacular and that I should check out, comment below! Note: Bullet Journal® is a registered trademark that is owned by Lightcage, LLC. Please visit Ryder Carol's official website at www.bulletjournal.com. 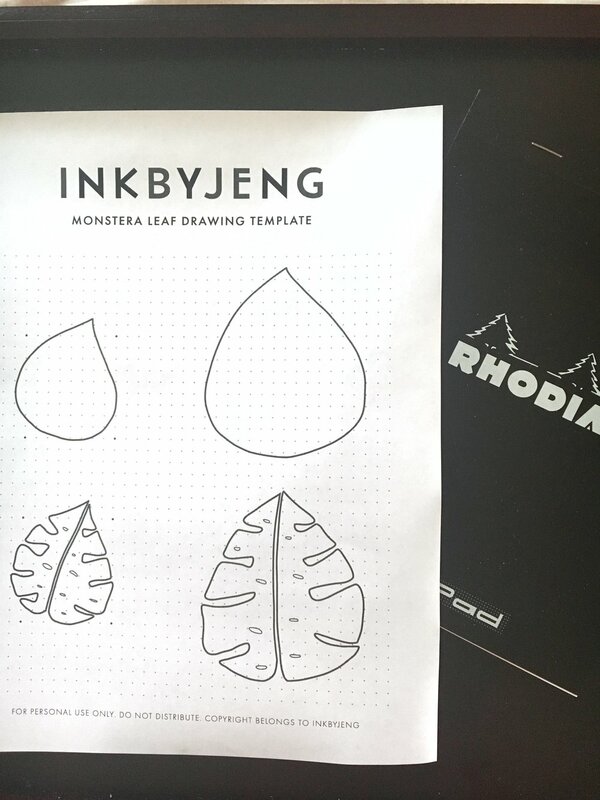 Bullet Journal® does not endorse INKBYJENG.